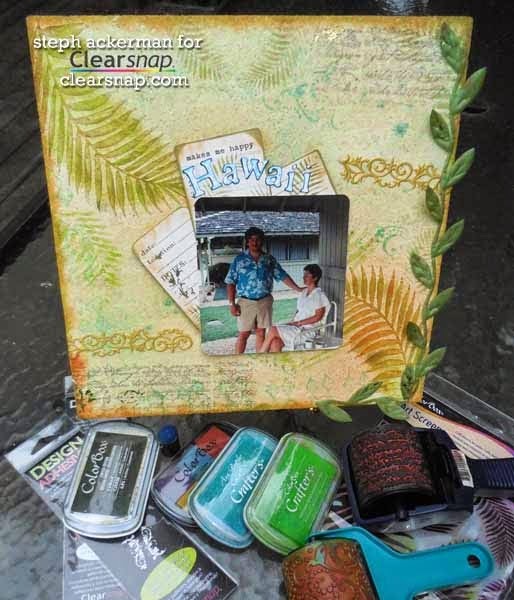 Welcome to the Clearsnap and Smoothfoam blog hop. 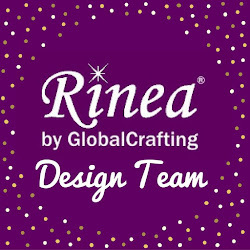 Hop along to each blog in the hop list to see inspiring ways to use Smoothfoam with Clearsnap's ink, created by teams of designers. Be sure to comment on each blog in the hop, then use the Rafflecopter widget at the end of this post to enter to win a prize pack of Smoothfoam and Clearsnap goodies. Smoothfoam is styrofoam that has a smooth finish so it can be used for all kinds of projects. Smoothfoam is definitely a fun product to work with because it has endless possibilities. I chose to use it as a base for a 3 dimensional mixed media layout. 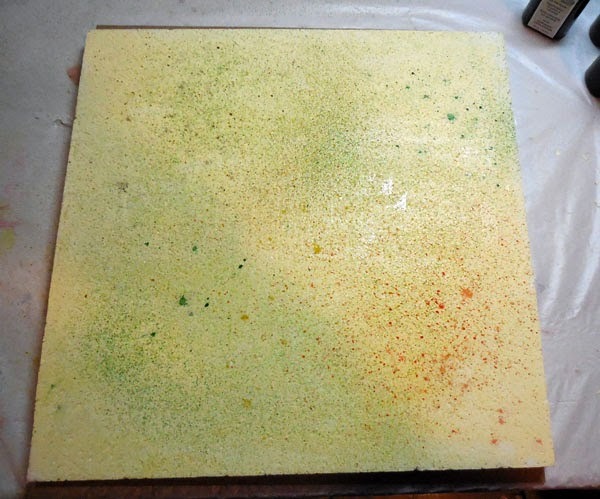 To begin, I spritzed the 12" panel with ColorBox Spritzers in Lemon Drop, Putty, Mermaid, and Pumpkin Pie. 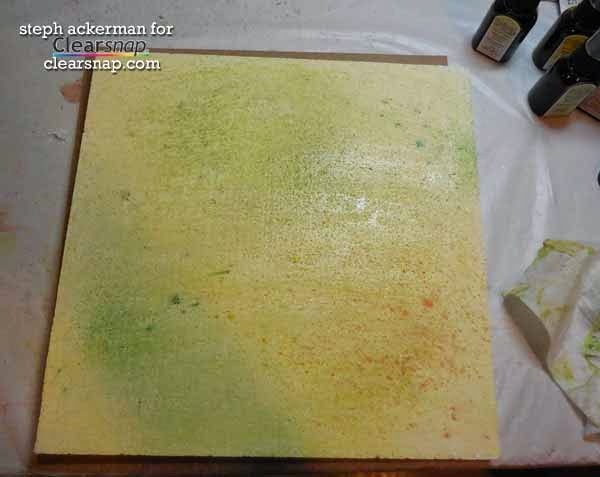 Using a baby wipe, I randomly mixed and moved the colors around the foam. I wanted some areas smooth and some a little more blotchy. Placing the ColorBox Tropical Art Screen on top, I added modeling paste through the screen to create 3 dimensional images in the corners. The more modeling paste I added, the more dimentional the leaves became. 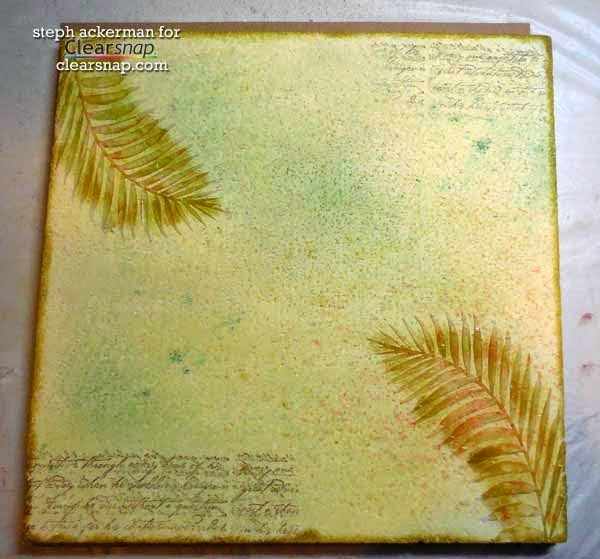 Once dry, I added color to the leaves using Guacamole Chalk Ink with an art dauber. Using Chestnut Roan Chalk Ink, I gently rolled the Wordwords Rollagraph Wheel across the foam in the corners opposite the stenciled leaves. Using an art dauber, I then inked around the edges of the panel with a ColorBox 6 color ink pad in Farmhouse. 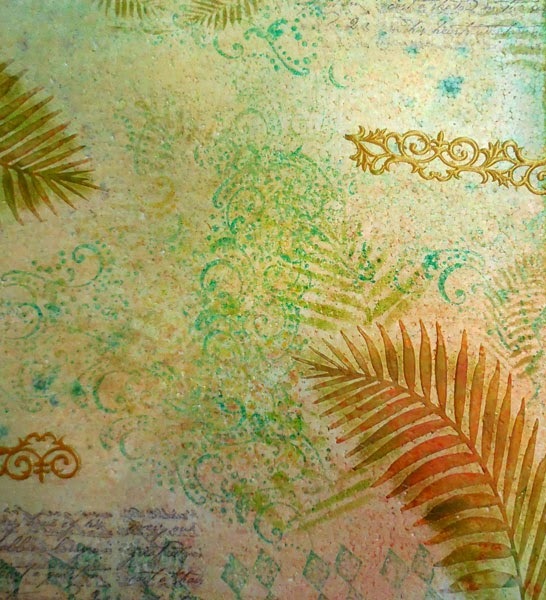 Using an art dauber, I added additional layers around the panel using the Tropical Art Screen with ColorBox Crafter's Ink by Ann Butler in Limelight; the Fun Flourish Rollagraph Wheel with ColorBox Crafter's Ink by Ann Butler in Aquamarine; and a Hampton Arts stamp with ColorBox Crafter's Ink by Ann Butler in Aquamarine Ink. Adding the different images and assorted colors added a nice collage effect. I added some May Arts ribbon leaves around the right side of the panel and added some smaller strips of self adhesive gold ribbon around the panel. Using French Swirl Designer Adhesives with Goldmine Designer Foils added another layer of dimension around the panel. You will not get a complete image transfer because of all the inks used, but the bits that do adhere provide some real character to the panel. 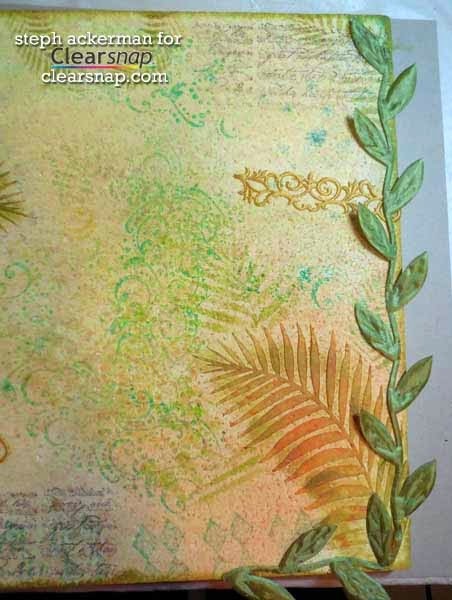 I added the left over pieces of Designer Adhesives and Goldmine Designer Foils to the May Arts ribbon leaves. Since I wanted the title to blend with the colors I used, I inked white cardstock with the Fun Flourish Rollagraph Wheel and ColorBox Crafter's Ink in Aquamarine, then added the title above the photo. 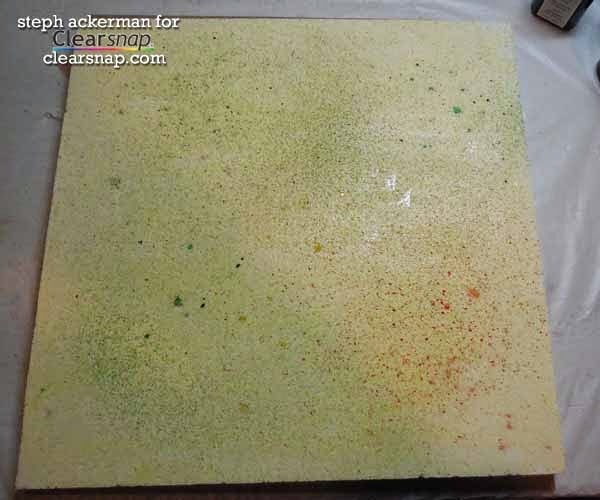 To finish, I used an art dauber to add more color around the edges, blending more color from the edges onto the panel. 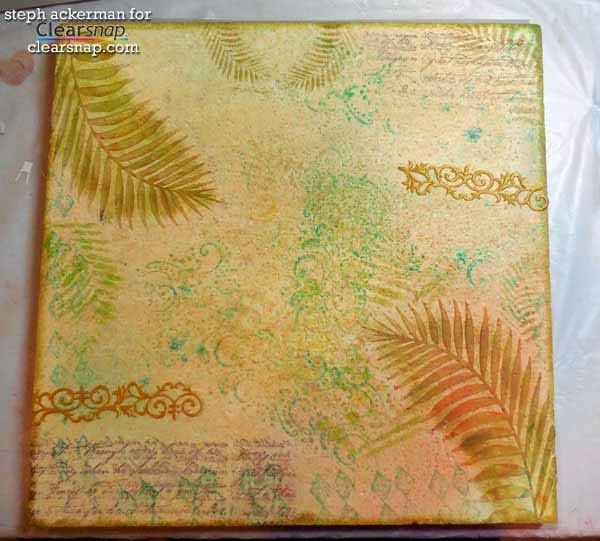 Then I used Ann Butler's stamps from KellyCraft to finish the sides of the panel with ColorBox Guacamole Chalk Ink. Smoothfoam is an amazing surface for mixed media work. 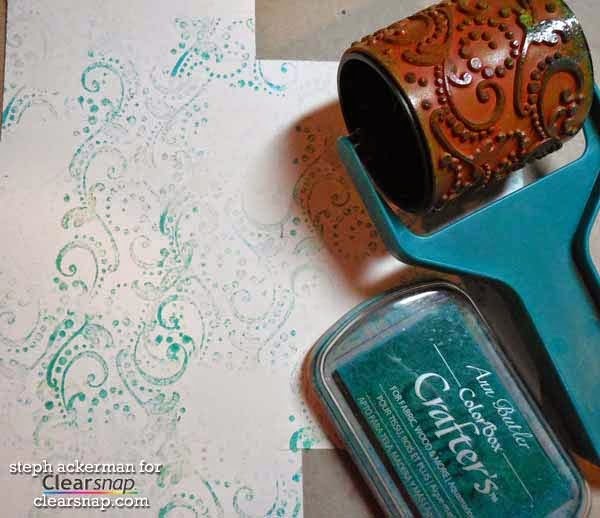 The inks and spritzers do not dry immediately so you have time to create some fun effects. I love how you made the leaves. I had to read the directions like three times because they look so real! 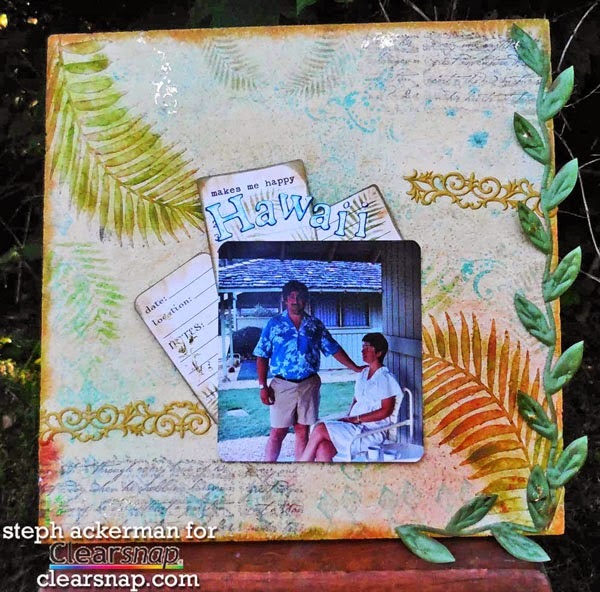 Lovely project, Steph! 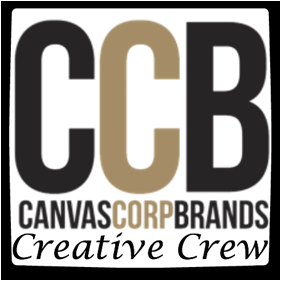 All of these projects are just amazing, great canvas!! love the colors. So pretty! I love the texture and layering. Thanks for sharing. I love the colors on this and the leaf ribbon is really cool.